QDR is proud to Back the Blue and support all Law Enforcement Officers. We continue to keep Officer Ainsworth and Trooper Harrell, who were both shot in the line of duty, in our prayers during their recovery. If you’re looking to help and honor the bravery of these men, check out this list of local fundraisers and donation opportunities. Officer Charles Ainsworth was shot multiple times in Raleigh and continues to for his life in the hospital. To make a donation, please write checks to “LGFCU” and in the memo line indicate the deposit is for The Charles Ainsworth Recovery Fund. Papa Murphy’s is donating 25% of sales Thursday, January 17th to help Ainsworth. The Hibernian, which has locations on Glenwood Avenue and Falls of Neuse Road, is giving 10% of sales on Wednesday, January 16th. State employees can donate their leave hours to Ainsworth’s wife, who is a teacher at Dillard Road Middle School, so she can continue to stay by her husband’s side. You can donate by filling out this form. The Flying Biscuit Cafe is celebrating their 10th anniversary on Sunday, January 20th from 6pm – 9pm and is collecting $10 donations. A GoFundMe page has been set up for Officer Ainsworth by the Wake County chapter of the North Carolina Sheriff Police Alliance. Due to the way the page was set up, the money can only be transferred to Ainsworth directly. If you want to provide more immediate help to the family, you should donate to the SECU account. Please note: The Ainsworth family, and Raleigh Police Department have not endorsed the page. 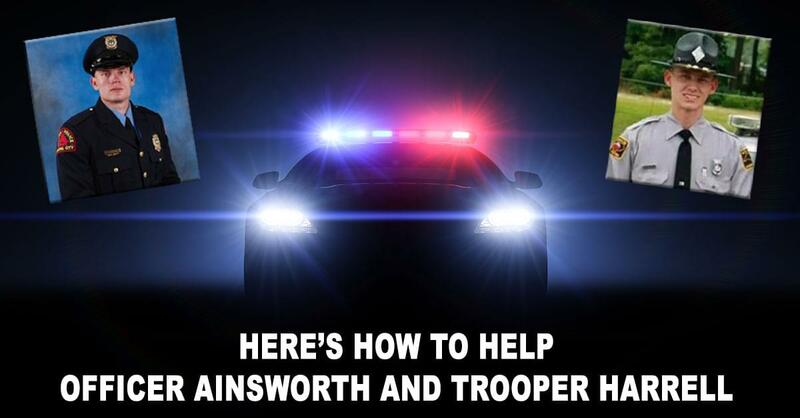 Forged Fitness in Raleigh is offering free community fitness classes on Saturday, January 19th and will be collecting donations for Officer Ainsworth. The Raleigh Beer Garden will be donating 10% of proceeds on Thursday, January 17th to help Officer Ainsworth. Honest Abe’s Kitchen & Bar will be hosting a fundraiser on Saturday, January 26th. A $10 minimum donation is requested and they will also be hosting a raffle. Trooper Daniel Harrell was shot in Wilson County on Monday, January 14th and has been released from the hospital. A GoFundMe page has been set up to honor his bra avery. You can donate here.